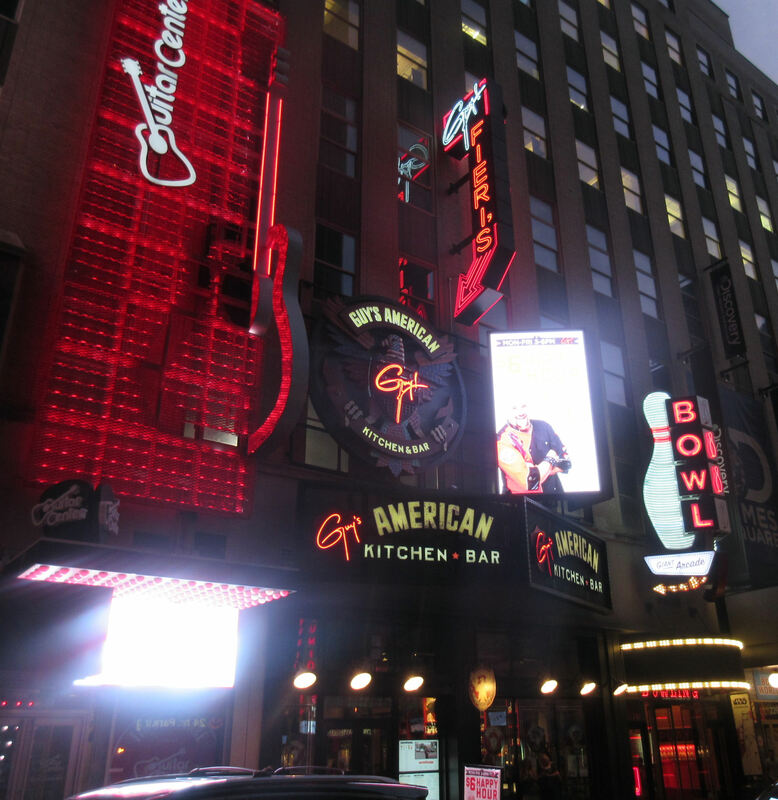 2016 NYC Trip Photos #12: Manhattan Mealtimes II « Midlife Crisis Crossover! 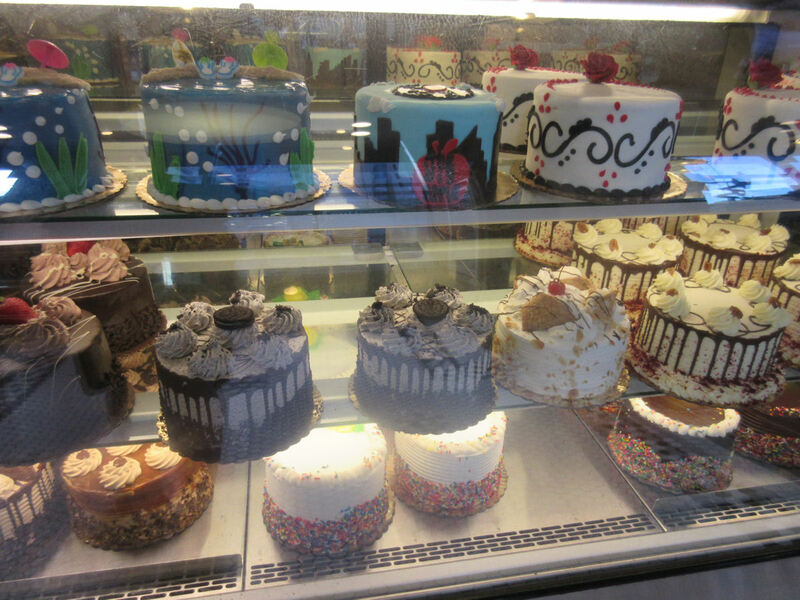 Sweet, sweet New York City cakes by way of New Jersey. As Seen on TV! Day Three in Manhattan brought us more interesting adventures in the fabulous field of food — twice in Times Square, twice in Chinatown. One was a recommendation, but the rest were discoveries on the go, this time with no flawed assistance from Google Maps. For breakfast Anne and I walked toward the Port Authority and into the Manhattan chapter of Carlo’s Bake Shop, the dessert destination best known to viewers of TLC’s reality series Cake Boss, now in its eighth season. I’ve never watched a single episode, but if someone wants to sell me exquisitely designed snacks for a fair price, I won’t give them an automatic no. We had hoped to visit at least one restaurant owned by the judges from the Food Network’s Chopped, a weekly staple in our household, but they’re all either five-star and beyond our reach, or located in neighborhoods nowhere near the stops on our to-do list. So Cake Boss was the closes we came in Manhattan to experiencing anything vaguely TV-food-related in person. 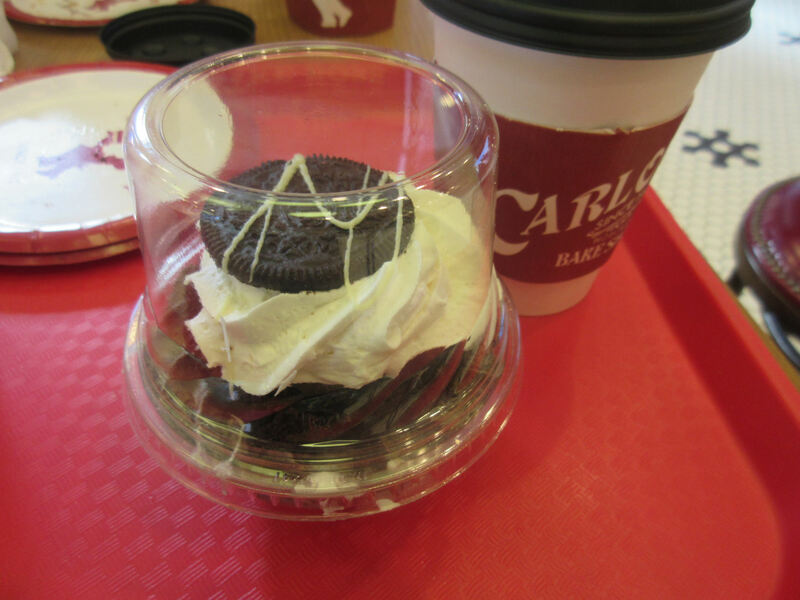 In addition to the full-size cakes in our lead photo, Carlo’s sells a wide array of cupcakes in various flavors and styles, some for exorbitant prices. Their coffee’s okay, and their cookies are fine and cheaper. When we woke up my son later back at the hotel, this ten-dollar Oreo cupcake was his breakfast. Thankfully it took zero effort to make sure he ate the whole thing and got my money’s worth. 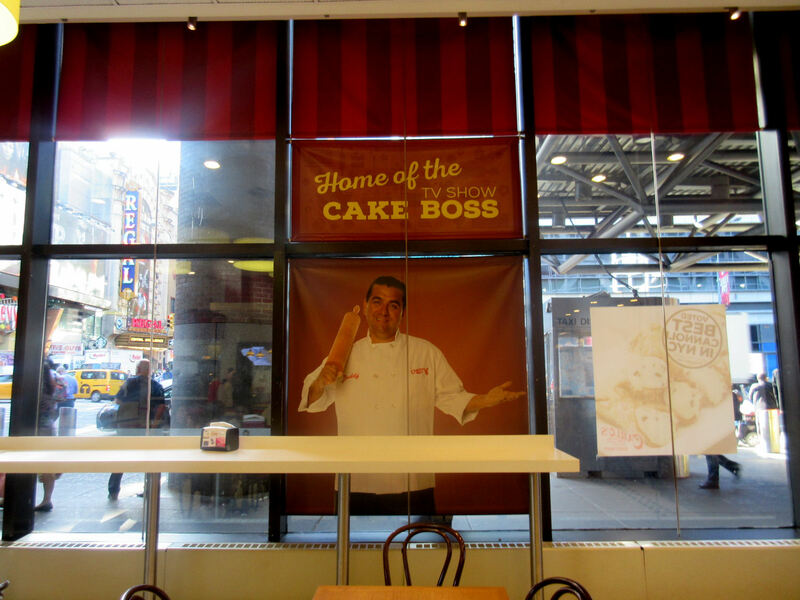 Fans can also choose from a selection of Cake Boss merchandise, if that’s their thing. 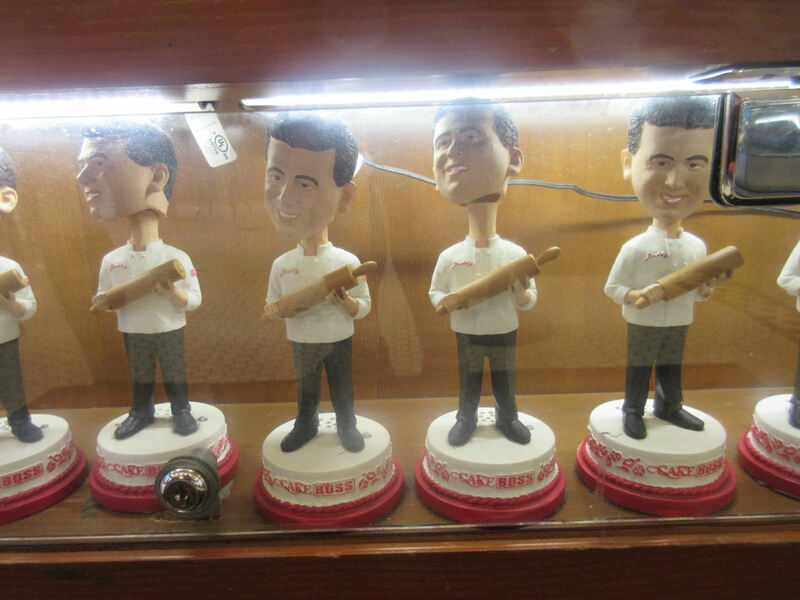 These Cake Boss bobble-head dolls may not be official Funko Pop collectibles, but for the right fans I presume they’ll do. Despite the price, that lone cupcake was insufficient to contain my son for more than an hour. Later in Chinatown, we picked a random restaurant for lunch right around the moment when we thought he would keel over from starvation and/or dehydration. The winner was Mott Street’s Big Wong King, the only restaurant I’ve ever seen whose official site posts the results of their most recent health inspection. Their energetic waitstaff kept the dim sum coming and who were clearly seeing if they could feed us till we burst. 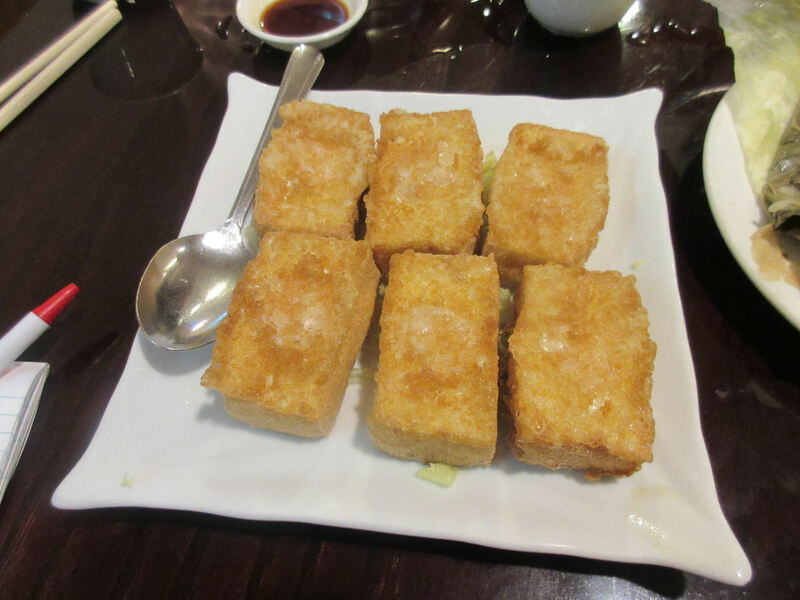 My main dish of crispy shrimp-stuffed bean curd, alias Tofu. These refused to cool down long after they’d left the fryer. Anne’s shrimp-based lunch, whose official name I failed to capture. 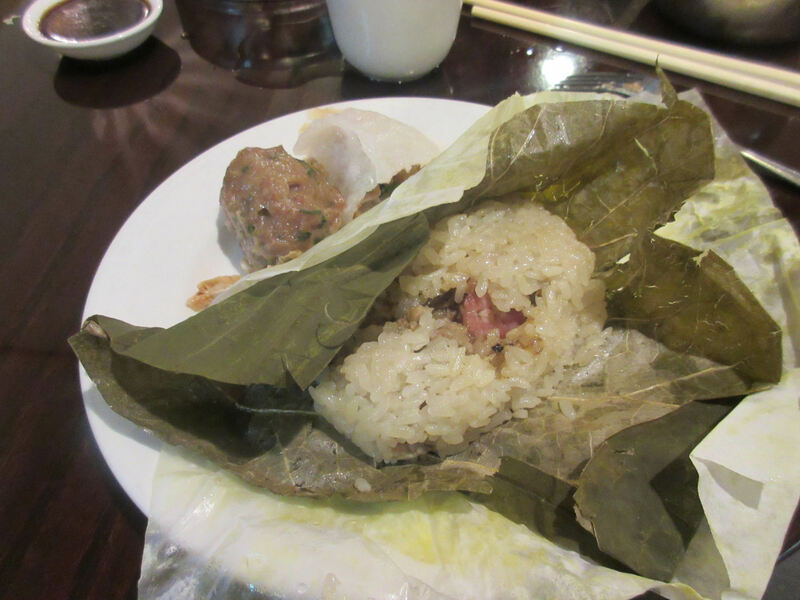 Our waitress did several drive-by offerings of additional items, such as sausage and sticky rice wrapped in grape leaves. The pork meatball on the side was from another, smaller dish. Among the items not pictured: taro dumplings. Those ended up being my exclusive addition by default. 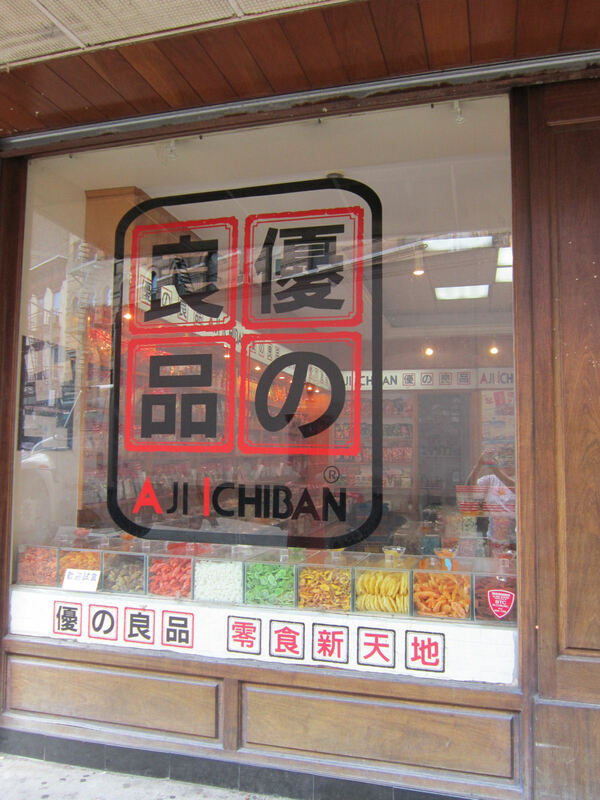 Farther down Mott Street, we stopped for snacks at Aji Ichiban, a Hong Kong-based franchise that specializes in candying fruits, vegetables, fish, and other edible items not normally associated with children’s palates here in America. 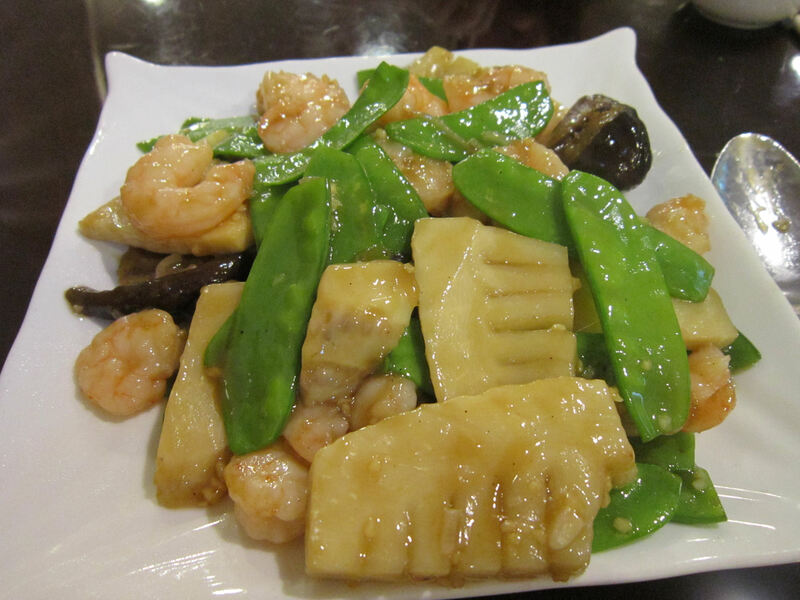 Chinatown once had five locations, but the Mott Street location is the area’s sole survivor. They’re also one of only four such stores left in the U.S. Chicago has one; Los Angeles has the other two. Dried papaya and preserved fig were among the dozens options that didn’t make the cut for us. As an experiment I bought a quarter-pound of a peach/plum hybrid that was so overpoweringly tangy, I couldn’t bear to eat more than one piece at a time. The small bag took me three weeks to finish off. 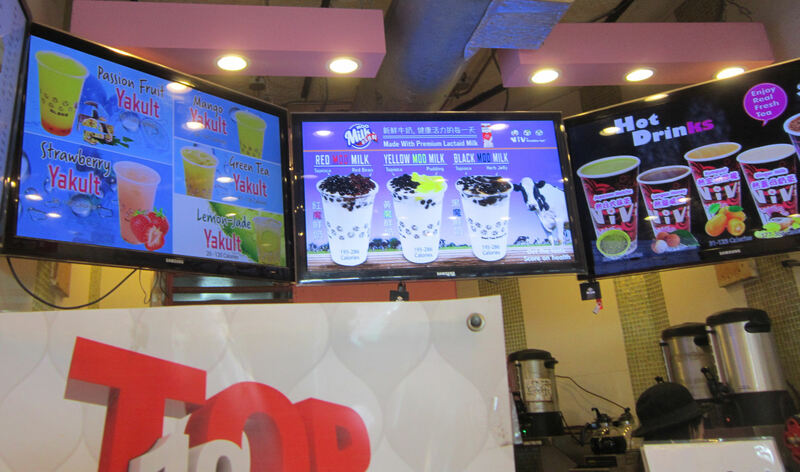 We later popped inside Vivi Bubble Tea for drinks, but the results were more like a dessert. I am somewhat old and oblivious to some types of change, and was therefore unaware that bubble tea did not mean carbonated Nestea. As I now understand it, it’s tea mixed with fruit juice and/or milk, then filled with a layer of tapioca balls, gelatin cubes, or other squishy geometric shapes. Flavor options flashed upon us from above. 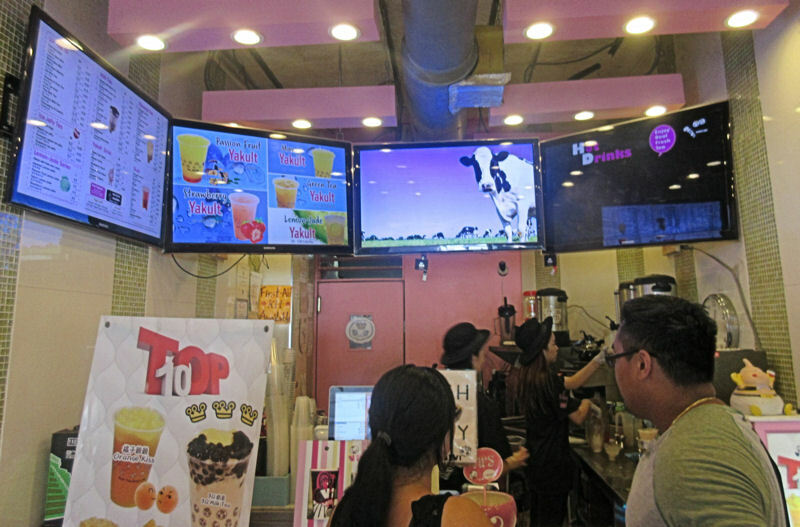 Animated menus and sharp uniforms are among the visual treats to be had while waiting for your solids-in-suspension treats. Rather than try in moderation, I went all-in and ordered a 3q Milk Tea, which contained tapioca balls, red beans, and possibly grass jelly, our old nemesis from 2011. Or perhaps it was another amorphous sugar-based objects, I’m not sure. All I know is the milk/tea mixture was more milk than tea and did little to quench my thirst, and the axis of bouncy-dots at the bottom obscured every sip. I was reminded of the sensation you get when you accidentally drop large chunks of donut in your coffee but keep drinking it anyway. 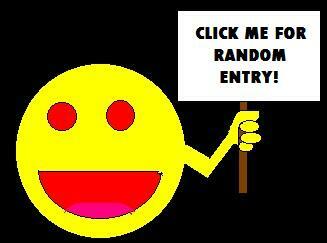 This thought summoned images of backwash in my mind, grossing me out and effectively making mine impossible to finish. But if the kids these days can’t get enough of the stuff, more power to ’em. I’ll be over here with my coffee and a metal strainer, just in case. Our dinner for the evening was suggested by a coworker who once lived and produced on Broadway. “Suggested” is an understatement — the closer we got to takeoff, the more loudly he insisted every other day, “EAT AT VIRGIL’S!” Mostly we tried it so I could shut him up when I got back to the office. When I think “New York cuisine”, Southern-style barbecue isn’t among the first fifty items on my brainstorming list, but whatever. The lights in their upstairs seating was minimal and didn’t lend itself to much photography, especially in our exhausted state from the long, long day. I can confirm we all loved our respective dishes — I and my Carolina Pulled Pork, my son and his mac-‘n’-cheese, and Anne and her Memphis-style pork ribs. At the end of every meal they bring out hot towels for everyone to clean themselves up. None of us had any energy or room left for dessert, but I’m sure theirs is fine. As is the case with so many of our visits to so many kinds of nice restaurants, Anne’s portions were much larger than mine. We have no idea why this keeps happening. As we shuffled back to our hotel for the evening, we took note of the other restaurants around us. We couldn’t possibly get to all of them by the end of the week. Choosing between them would become difficult at times. Some, we just knew, were prettier on the outside than what we imagined they were like on the inside and were easier to bypass. Maybe someday we’ll be compelled or possibly dared into eating at a joint named after TV’s Guy Fieri, but it didn’t happen this week. 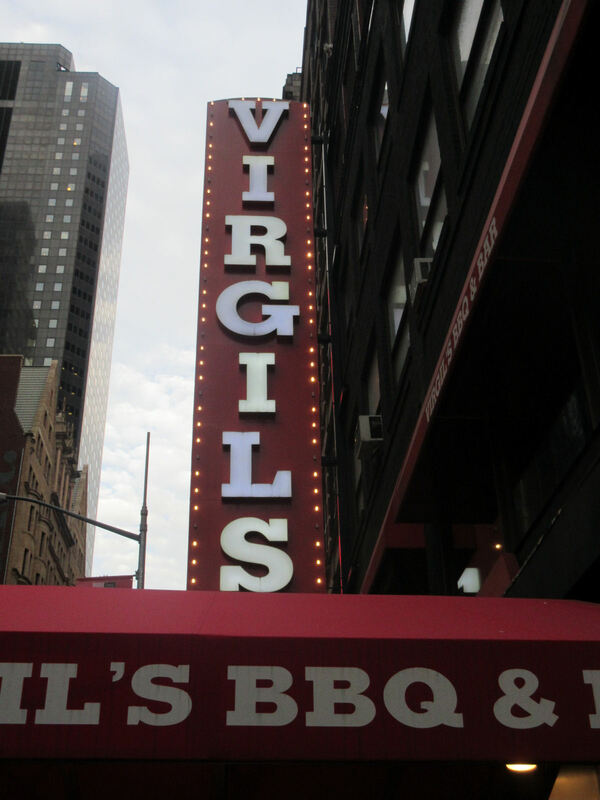 Virgil’s is going on my list for our next NYC trip!